This Drop In Piston Kit was designed in the same manner as our Series III Engine 160HP Drop In Piston Kit. The new 800R Drop In Piston Kit from RK Tek is rated at 12HP increase on 91 octane fuel with the stock exhaust system. The torque curve is extremely broad and linear which allows for VERY easy clutch tuning. BONUS: The RKT piston with pin is 70 Grams lighter than the Stock OEM piston with pin. So, not only do you have a much better dual rings design, you also have a much lighter piston that will allow for much quicker revving.. NOTE: For the ETEC, we have chosen to re-shape the stock head vs. the billet. This allows for an even less expensive performance kit! THE ETEC KIT is ONLY $570.00! 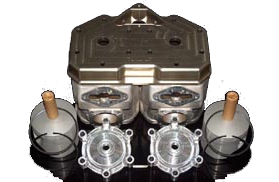 This includes 2 very custom pistons, base gasket and a head re-shape!